Load Ring VLBG M10 with standard bolt 0.63t WLL. Rud Universal bolts and nuts for VLBG are 100% crack detected. The hex-head-bolt is suitable for internal and external wrench mounting for types with metric heads. Surface protection - CORRUD-DT offers at least 20 times better corrosion protection than zinc plating (except for the spot face) after length shortening. Clear identification at the bolt head: RUD, thread size, quality class. VLBG Load Ring will turn 360 degrees, adjustable in pull direction. 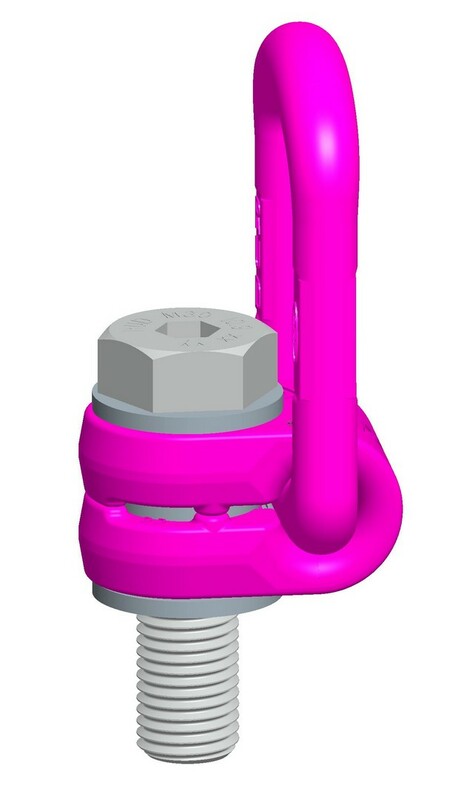 Load Ring foldable, full WLL in any direction, surface pink powder coated. Threaded over whole bolting length (16mm).